Thank you thank you thank you!! After I finished Splintered I wanted a sequel more than anything. I didn't want to leave the fantastic world that Ms. Howard had created and I am so thankful that my begging and pleading was heard. Unhinged is an amazing sequel that takes the reader back to Alyssa and her Wonderland. A.G Howards Wonderland is like nothing I have ever seen. It is dark, creepy, amazingly beautiful, and beyond whimsical. This second book in the Splintered series takes us back to Alyssa and her fight to stick with the life she chose. It hasn't been easy keeping her netherling side closed off, but she has managed to put most of Wonderland behind her and focus on her art and boyfriend Jeb. Wonderland isn't quite finished with her though and through her mosaics Alyssa realizes that her court might be in danger. Should she stay away and live her life with Jeb or fall down the rabbit hole again and try to save her netherling home?? I wasn't sure what Alyssa would do and the story never slowed down to let her really think about what she wanted. She had to act fast and with her choices of course came devastation, but she also learned a whole bunch of stuff that I promise if you loved the first book you will want to learn it all as well. I am in shock over so much that was revealed and again I have to say THANK YOU to the publishing gods and Ms. Howard for delivering this sequel. It is everything I could have hoped for and so much more. If you thought the twists in the first one were good you haven't seen anything yet my friend! And I have to address the elephant in the room...Team Jeb or Team Morpheus??? I think if I remember correctly I declared myself Team Morpheus from the get go and after reading Unhinged I am still proudly waving my Team M flag. Don't get me wrong Jeb is a great character and well that last scene with him and Alyssa was pure awesomesauce but Morpheus holds my card of hearts. Yes he is infuriating and yes he is deceitful, but there is just something about this moth boy that pulls at my heartstrings! He knows Alyssa can hold her own and he doesn't ever let up on her. Normally his shenanigans would have ticked me off, but what can I say I just lurve the man! I am really curious how this series will end. After that ending I am on pins and needles to see what Alyssa does and honestly after I finished this book I just wanted to laugh manically like the Mad Hatter! The ending really couldn't have been more perfect though, it really shows where Alyssa is headed and completely brings the series full circle. And even though we don't get to see Wonderland in this installment the whimsical creatures are still there and the beautiful Wonderland still paints an amazing backdrop that you can feel throughout the story. This is another Blizzard read for me. 5 Snowflakes just won't do at all. Oh and I really and I mean REALLY hope Alyssa keeps her vow to Morpheus! That chapter has to make it in the third book! PLEASE!!! And because I love this series so much I want to offer one lucky reader their very own set! 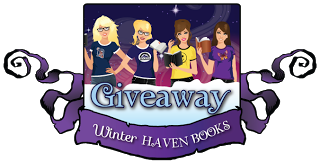 This giveaway will include copies of both books ordered from TBD. Just a reminder Unhinged isn't out yet so that one will be preorderd and normally they ship everything together so both books should arrive after Jan. 7, 2014. 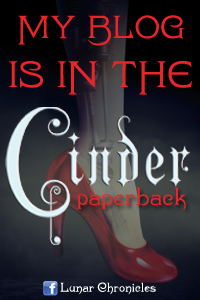 I loved the dark Wonderland she created in Splintered, so I can't wait to return! I'm also a proud member of Team Morpheus. I didn't like Jeb at al.. but he might be a little better here, I'll give him another chance. The ending sounds great :D! So glad you loved it! I absolutely adored Splintered. I cannot wait to read Unhinged. It's bound to be excellent!!! I have Splintered sitting on my shelf to read. I love these covers! I have been dying to read these books! I am so crossing my fingers on this one! Thanks so much for the opportunity! I have heard so many great things about Splintered from a friend and I would love to read Unhinged too, the cover is gorgeous! I love these book covers and have been dying to read them but haven't had time yet. I would LOVE to win the series!!! THANKS!!! I haven't read any of the Splintered series yet but I'm fascinated by Alice in Wonderland adaptions. There are so many interesting directions an author can take the story in and I'm extremely curious to see where Howard took it! Ugh, Rafflecopter, the bane of my cyber existence!!!! 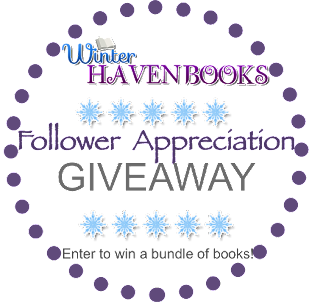 Awesome review I just love love love Splintered and I can't wait to get my hands on Unhinged thanks for the great giveaway! Can't wait to read this! Love the cover and awesome review! Thanks! I've heard so many good things about this series (and really want to read Morpheus...) Thanks for the giveaway! I heard so many good things about this series. Would love to dig in. I haven't read either book yet but infuriating and deceitful are two of the ingredients I demand in all of my boy cocktails. 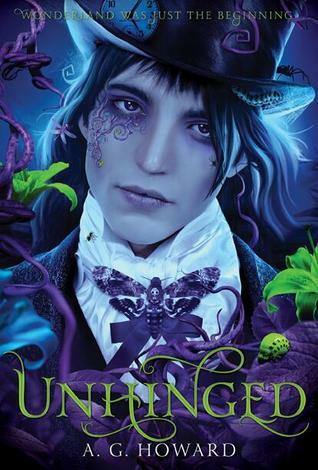 I LOVED Splintered so much, I can't wait to read Unhinged!! Oh my goodness this book looks amazing! I absolutely loved Splintered it was so good and I can't wait to see what happens next for Alyssa! Love love love to win this. Thanks for a chance! I am so excited for this release. Thank you for the chance to win! I am so excited for more of these books! I have Splintered and absolutely CANNOT wait to get my paws on Unhinged!! So excited! I want these so bad!!! My daughter and I borrowed Splinter from the library to read and now we want to own it and we want to read Unhinged!!! Thank you for the giveaway and the chance for us to win the books!!! I'm so excited to read this series! It and Alice in Zombieland are on my TBR of retellings that must be read. I've been wanting to read these books for so long, they look great! Thank you for having this giveaway! I just love the covers for these books. So gorgeous! I'm looking forward to starting the series. Thanks for the giveaway. I'm almost finished with Splintered, and I'm so excited about Unhinged. I'm glad I didn't find it until now so I can read them just about back to back! I agree; Morpheus will always have my heart, and if Alyssa doesn't choose him, hey, I'd be more than happy to have him, lol. Thanks for the great giveaway! Your review has me excited about reading this series. It's been on my TBR for awhile but I've put off reading it. I'll have to definitely read it soon. I love this series!! I have been waiting forever for unhinged to come out and it is almost here!!!! LOVE THIS SERIES! And Morpheus! Eep! So excited for this. Thanks for the giveaway!! Yay! First I just have to say that the covers for both books are absolutely beautiful. Love, love, love!! I really pray I win this one!! It would be absolutely amazing to win both of these. I've been wanting to read them for quite awhile now. I loved 'Splintered' and I can't wait for 'Unhinged'! I'm sooo excited. AHHH!! I've been dying to read this series! I love retellings of fairy tales.... this looks perfect! I haven't read Splintered yet and I'm dying to get my hands on it!! Love both the covers to bits.